Barnaby Hone on crypto currencies & block chains: the new POCA frontier? Space isn’t necessarily the final frontier; at least not where crypto currency and block chains are concerned. 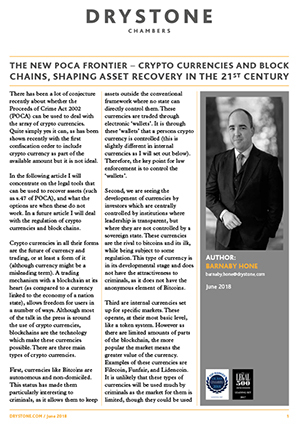 In the following article, part of a series of POCA, asset forfeiture and asset recovery articles, Barnaby Hone outlines how existing powers under the Proceeds of Crime Act 2002 (POCA) can be used in the fight against crypto currencies being used by criminals for money laundering and asset recovery evasion. He discusses the use of search and seizure orders, restraint orders and reparation orders and how these might be approached by both prosecuting authorities and defendants.